Former Scottish First Minister Alex Salmond has called for BBC Scotland to be run by Edinburgh following the broadcaster’s “biased” reporting in the run-up to the Scottish independence referendum last year. The former Scottish National Party (SNP) leader said the BBC’s Scottish division should be under the “democratic control” of the Scottish Parliament in Holyrood, Edinburgh. Salmond was a vocal critic of the BBC during the SNP’s pro-independence campaign last year, accusing it of peddling a pro-Union line. Thousands of independence supporters protested outside the BBC’s offices in Glasgow during the campaign over its perceived bias in reporting. Speaking to a SNP conference in Glasgow, Salmond said he was “surprised and disappointed” that the BBC had allowed itself to be influenced by a “biased press” largely opposed to a “Yes” vote in favor of Scottish independence. “Some of the experience of the referendum has scarred the BBC, and there has been some gain from it already from our perspective,” he said. Salmond admitted this was “an advance” on previous attempts by the SNP to gain nationwide attention during general election campaigns. The former SNP leader was met with applause from around 2,000 supporters when he attacked the BBC’s news coverage. One delegate at the conference was greeted with cheers when he announced he had canceled his BBC TV license following the referendum. 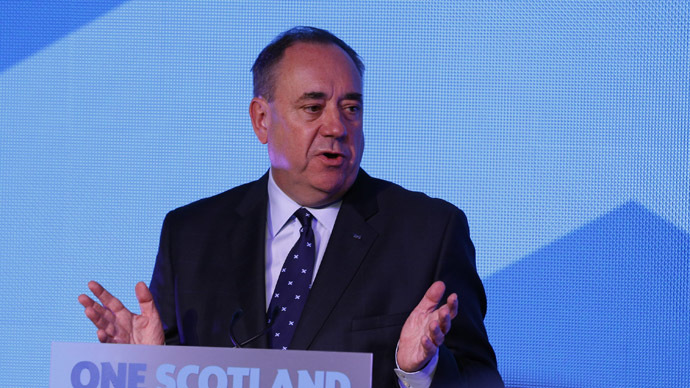 Salmond’s comments were attacked by Scottish Liberal Democrat president Sir Malcolm Bruce. It emerged last week that Salmond had postponed the North American tour of his new book about the SNP’s independence campaign, “The Dream Shall Never Die,” until after the general election. His headline-grabbing comments and pop star-like reception at the SNP conference over the weekend have prompted some to ask whether Salmond is actually still pulling the strings in the SNP behind the scenes. He stood down as First Minister following the 55-45 percent “No” vote last September. The new first minister and SNP leader, Nicola Sturgeon, has been forced to reassert her position as leader of the party.